Crackerjack was created by the folks from 28 HongKong Street HongKong Street and Proof & Company, so already they’ve got that going for them. With that in mind, you might think this would be a slick cocktail bar, but actually there is more of an all-day hangout vibe going on here. Think hearty and healthy breakfast and lunch dishes and substantial supper offerings in addition to a contemporary cocktail list. For us, it’s a great spot to head for a solid drink or two after work. The space is bright and cheerful thanks to huge windows, a fun blue, white, yellow and gold colour scheme and lots of potted plants. 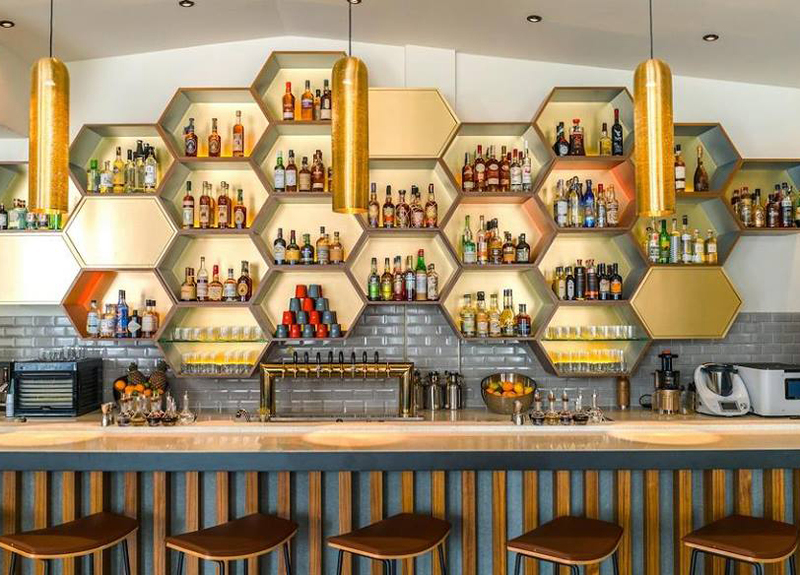 Behind the bar you’ve got honeycomb-like bar shelving with all sorts of bottles to choose from, and there are plenty of wooden communal tables that can accommodate groups. Plus, the servers and bartenders are amiable and the food and drinks are tasty and affordable. Come in the morning for their Bourbon Mashbill Grits with a 63-degree egg and a cup of joe made from Nylon Coffee Roasters, swing by mid-day for one of their lunch plates with offerings like the Lentil Mushroom Scotch Egg or Chermoula Chicken, and pop by after work for a few cocktails and a meal, which could include dishes like the Local Barramundi and Dingley Dell Pork Collar Chop. The cocktail selection is constantly evolving with weekly creations that feature unique flavour combos like the The Jumping Goat with Citadelle gin, Cascara Cold Brew coffee, lemon juice and tonic, or the Good Hombre with tequila, yellow Chartreuse, pineapple syrup, lemon and Peychaud’s Bitters. They’ve also got great bar bites to go with the drinks like the Spiced Chickpeas and the Beef Cheek Croquettes with tarragon aioli. Craft beers start at $12++, cocktails start at $15++, and dinner will set you back about $25++. Casual, laid back and approachable.